Jean Carr and Perry Shea. Photo courtesy: SCJ Alliance. Jean Carr became President and CEO of SCJ Alliance on October 1, 2018. Jean and former CEO Perry Shea founded the company 12 years ago along with Bob Jewell. The three of them have anticipated this transition for a number of years. Perry is now the Chief Business Development Officer, continuing his role as one of the firm’s lead practice builders. He will focus on advancing growing markets, such as cable and rail propelled transit systems, which include urban gondolas. 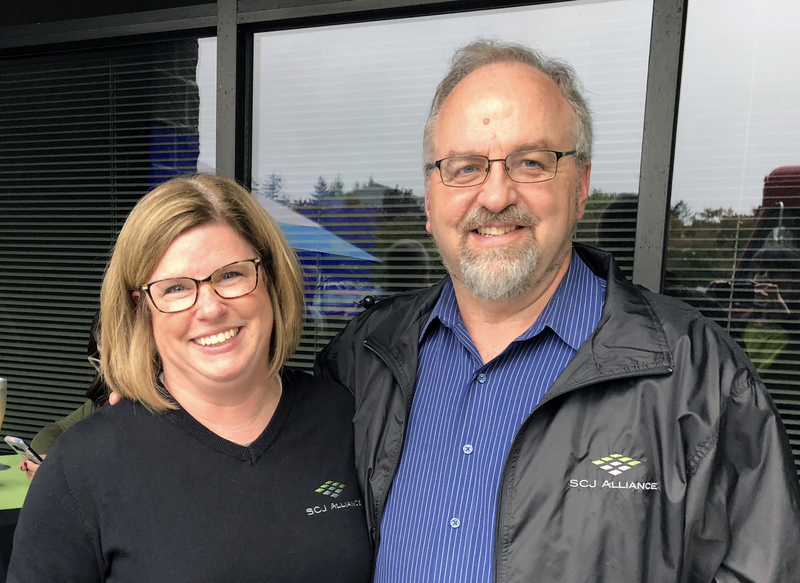 In addition to the CEO change on October 1, SCJ welcomed the firm’s 100th employee, this one in SCJ’s Centralia office. The company also has offices in Lacey, Seattle, Ballard, Vancouver, Spokane and Wenatchee, Washington and another in Boulder, Colorado. Project teams often include people from multiple offices who work together virtually, creating dynamic groups that seamlessly collaborate with each other.